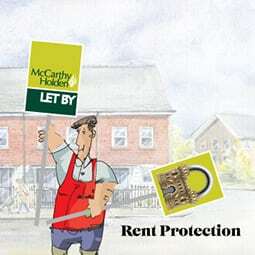 McCarthy Holden is a long established letting agents specialising in residential lettings and property management, paying landlords on time and keeping tenant deposits safe. You can feel secure in the knowledge that experienced, professional personnel will guide you through all stages of property management and rental, plus give advice on property investment and management. So even if you are a first time landlord taking your first steps in property rental or a seasoned investor with a lettings property portfolio, we are able to help. Client property is effectively and professionally marketed locally, nationally and internationally. We have links with multi-national corporations and other businesses with substantial ongoing staff relocation needs. These provide us with an excellent supply of quality tenants. Don’t forget to take a look at our tried and tested lettings process for complete peace of mind. Membership of a Government Approved Client Money Protection (CMP) scheme becomes a legal requirement for all agents dealing with residential lettings across England from Monday 1 April 2019. View our compliance certificate. As a Propertymark Protected firm, McCarthy Holden’s Client Money Handling Procedures are covered in the Propertymark Conduct and Membership Rules. The Rules are available here. 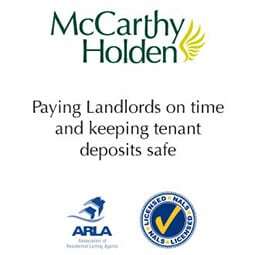 Landlords feel secure in the knowledge that McCarthy Holden focus on paying landlords on time and keeping tenant deposits safe. When you instruct McCarthy Holden to let your home ask about a Smart Rental Protection policy, for that extra peace of mind. 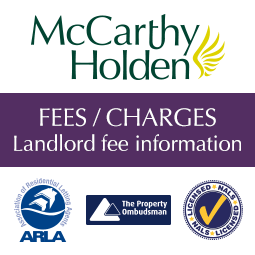 Please read about our landlord fees charged to McCarthy Holden landlords. Check with your local branch for any special landlord incentives available from time to time. Please read about our tenant fees charged to McCarthy Holden tenants. If you require further information please telephone 01252 622550.